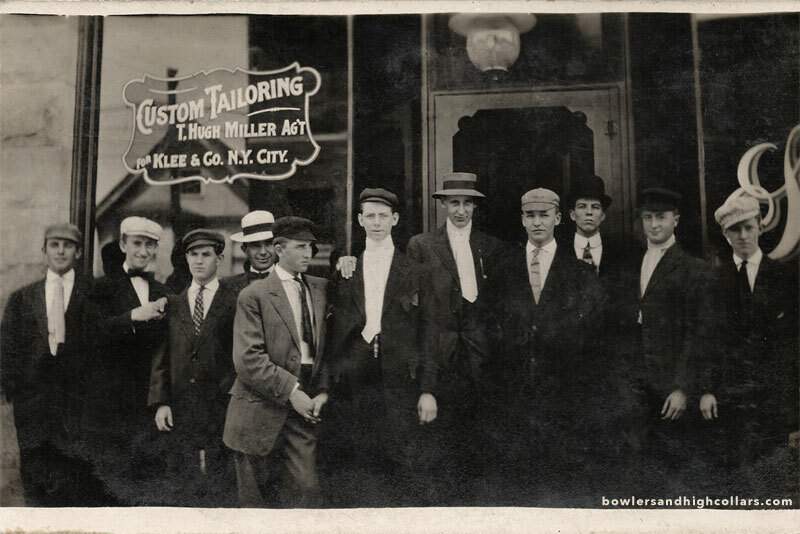 T. Hugh Miller Agent Custom Tailoring for Klee & Co. N.Y City. RPPC. Private Collection. Tailors and salesmen in front of their place of business with the stylish Art Nouveau sign. We have a bowler, fedora, pork pie, all sorts of caps, two white neck scarves, bowties, ties…There’s a little of everything here, as it should be! And four of them are holding hands. Gents holding hands didn’t necessarily mean they were gay, just close buddies not afraid to show affection toward each other. This was taken in the mid 1910s. Digital restoration work titled Holding hands at T. Hugh Miller Custom Tailoring by Caroline C. Ryan is licensed under a Creative Commons Attribution-NonCommercial-NoDerivatives 4.0 International License. This entry was posted on Monday, June 8th, 2015 at 12:28 pm	and tagged with 1910s, bowler, edwardian, fashion, fedora, Klee & Co, menswear, New York, occupational, T. Hugh Miller, USA and posted in Groups, RPPCs. You can follow any responses to this entry through the RSS 2.0 feed.